The General Lighthouse Authorities (GLA) have announced that they have installed a system called eLoran in seven ports across Britain. The GLA say many critical instruments on ships use Global Navigation Satellite Systems, and if they fail the consequences could be disastrous. The new system, which is ground rather than satellite-based, is designed to be used in the event of a GPS failure. 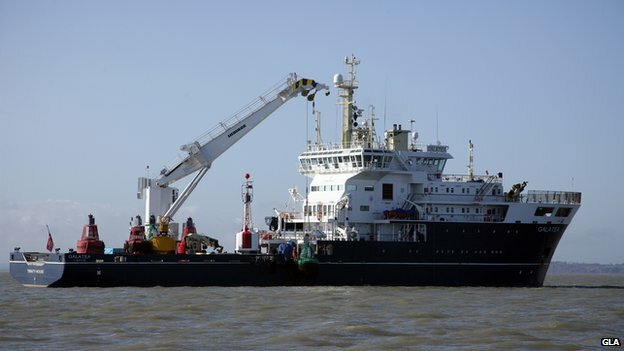 "All vessels that sail today are massively dependent on GPS, " Martin Bransby, research and radio navigation manager for the General Lighthouse Authorities of the UK and Ireland, told the BBC's technology programme. "It is their primary means of navigation - and a massive number of instruments rely on it too. "If you don't have it, you are dead in the water." 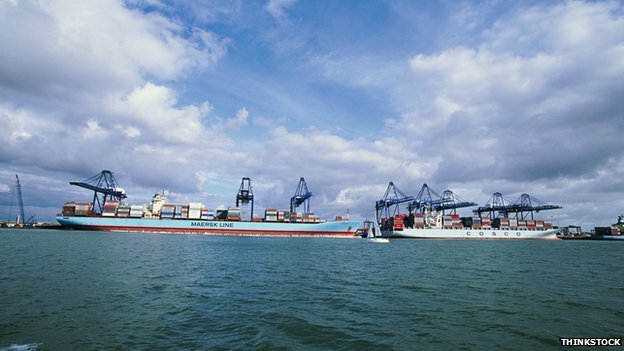 Testing for eLoran has taken place in Felixstowe, the busiest container port in the UK. Each year, three million containers are brought in on some of the biggest ships in the world. Safely manoeuvring these vessels in this packed waterway is vital, and currently the only way to do this is with the help of GPS. Onboard the Galatea, a ship that is 80m (260ft) long, the GLA have been finding out what happens if the satellite system goes wrong. Martin Bransby demonstrates a GPS failure by pulling the plug on the ship's receiver. Within a few seconds, alarms start to sound on the bridge as one by one the instruments stop working. "This is the gyrocompass - it steers the ship - you can see it starting to fail," says Mr Bransby. "If we walk over here, this is the radar, and that's not working either. This is the dynamic positioning: it holds the ship's position, that's not working. "The electronic chart display becomes unusable. Even the ship's clock stops working." In a series of tests, the GLA have found that almost every bit of kit on the boat uses GPS - even the onboard satellite entertainment system. Mr Bransby says: "You can imagine standing watch on this ship, it's the middle of the night, it's dark, it's foggy, you are in the English Channel, and then this happens. "What do you do? You're in a right mess, basically." Losing GPS is not a just theoretical problem. The system works using a fleet of satellites orbiting high above the Earth, but the signal they transmit is weak and can be easily interfered with. Other sat-nav systems - such as Galileo in Europe and Glonass in Russia - have the same vulnerabilities, says Prof David Last from the Royal Institute of Navigation. 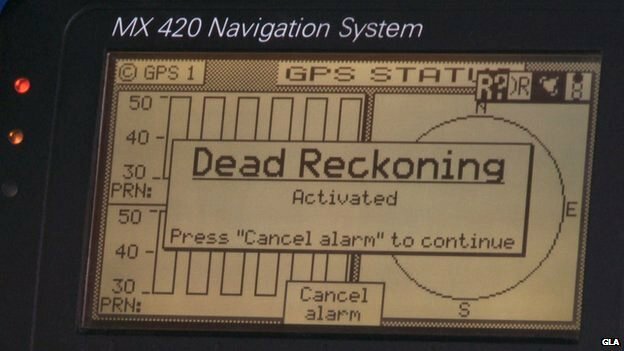 "A little bit of power from a jammer on the frequency used by GPS close to your receiver can deafen it, and it won't be able to hear the GPS signals," he says. "For example, jamming is a real issue in Korea. There have now been three occasions when the North Koreans have transmitted high-powered jamming in South Korea." The Sun too can knock satellite systems offline, he adds. 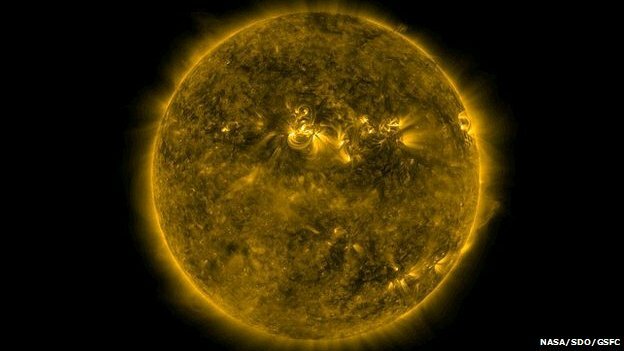 "It starts to transmit radio noise during solar storms, so intense that it either makes GPS positions wobble about or causes GPS to be lost across the entire sunlit side of the Earth." Until now, there has been no "Plan B" if GPS goes wrong, but the GLA says eLoran will be an important tool. The technology was developed during World War Two. The Long Range Navigation system (Loran) was the brainchild of US scientists and was used to guide US Navy warships as battles raged in the Pacific. After the war ended, it was updated and renamed Loran-C, and adopted by mariners around the world - until GPS took over. Now though, rebranded as eLoran, its infrastructure has been upgraded to make it more accurate and it is making a comeback. While GPS transmitters are based in space, eLoran's are based on the ground. Radio stations transmit long-range radio waves. They use the same method as GPS to pinpoint position, but there are crucial differences. Professor Last says: "The neat thing is this: the radio frequencies which eLoran transmits are completely different from those of GPS. "The power levels, instead of being very weak, are very strong; the propagation of the radio signals is very different." He adds: "Everything that matters is very different (from GPS) so there is no common mode of failure. The result you get is a plug-and-play replacement for GPS." The General Lighthouse Authorities have finished installing eLoran in seven ports along the east coast of Britain, completing the first phase of their roll out. It is now in place in Dover, Sheerness, Harwich and Felixstowe, Middleborough, Leith, Humber and Aberdeen. Onboard the Galatea, Martin Bransby demonstrates how a dual e-Loran and GPS receiver works. He says: "What happens inside this box is when we see some interference or jamming or a satellite failure, there is an algorithm that decides to swap over to eLoran. And it does that seamlessly." For now, eLoran is being tested for shipping, but it could also play a role on land for the vast array of systems that use GPS. Prof Last says a back-up is long overdue. "Most people think of GPS as the system that runs their car sat-nav and tells their smartphone where it is," he tells the BBC's Click. "But there is probably no area of industry, of commerce, or telecoms, that isn't now dependent on GPS. And if we lose GPS we lose them all." This is a shortened version of the 1947 "LORAN for Ocean Navigation"
filmstrip produced by the Coast Guard as a sales pitch to commercial shipping lines to adopt LORAN (as a both a navigational aid and to assist in distress situations). Updated with a new narration track in place of the distorted period track, the film provides a brief overview of the operational theory behind LORAN. But the system may never go global. The US Coast Guard is busy decommissioning the existing eLoran infrastructure. And in Europe, the governments of Norway and France have said they will cease operations next year. Commercial companies may take up the reins, but without support from some of the biggest shipping nations, the eLoran safety net may not be around to rescue everyone. Aviation today : GPS Backup: Is eLoran the Answer?